Description: Zinc Statue, mounted on a granite base. Approximately 12' tall. The base is inscribed: "In Memory Of The ~ Heroes Of '61 - '65 ~ May The Deeds Of Valor Of ~ Them And Their Comrades ~ Forever Inspire Love Of ~ Liberty And Country ~ Erected By The ~ G.A.R. 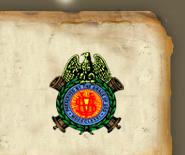 The W.R.C. And ~ Citizens ~ Of Bronson, Kansas ~ 1907." 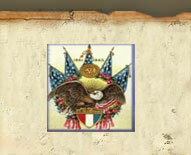 The other sides of the base have various raised medallions and patriotic symbols. 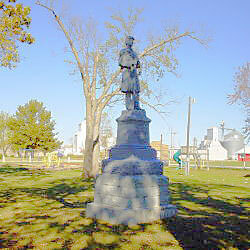 Description: Soldiers' monument standing thirty feet high, including a statue of eight feet six inches. 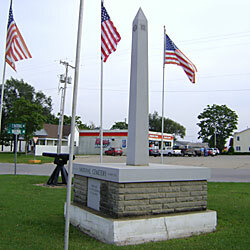 The monument is composed of three bases, the first eight feet square. The first die contains this inscription: "In Memory Of The Volunteer Defenders Of The Union, 1861-1865"; The Second: "1906 ~ Erected ~ By Wm. H. Lytle ~ Post, No. 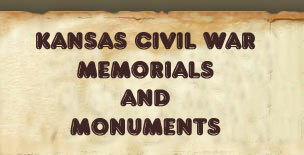 32, ~ Department Of Kan ~ By Public Subscription"; the third: "The Men In Whose Honor This Monument Was Erected Were Led By Fires Of Liberty. They Fought For No North, No South, No East, No West, But For One Glorious And United' Country." 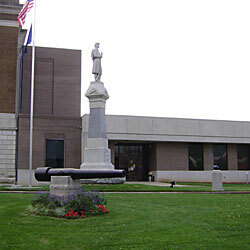 The statue is also of granite, and represents a private soldier at parade rest. 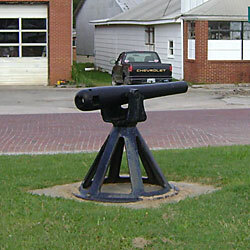 Next to the monument is a 30-Pounder Parrott Rifle on a concrete base. The weapon is iron, rifled, has a bore diameter of approximately 4 1/4 inches, and is approximately 132 1/4 inches long. 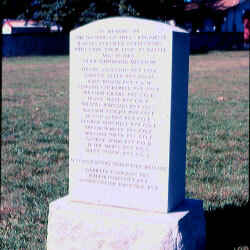 Description: This granite marker, located in the National Cemetery, is inscribed: "In Memory of ~ the Soldiers of the 1st Regiment ~ Kansas Colored Volunteers ~ Who Gave Their Lives in Battle ~ May 15, 1863 ~ Near Sherwood Missouri ~ (15 names) ~ Second Kansas Volunteer Battery ~ (3 names)". 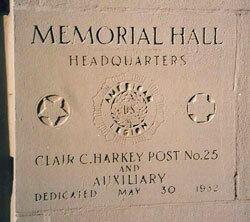 Description: This marker, in the Fort Scott Memorial Hall reads: "Memorial Hall ~ Headquarters ~ Clair C. Harkey Post No. 25 ~ and ~ Auxiliary ~ Dedicated May 30, 1932. Description: A 3-Inch Ordnance Rifle converted to breechloader is mounted on a pivoting metal salute base. The weapon is wrought iron, rifled, has a bore diameter of 3 inches, and is approximately 68 1/2 inches long. 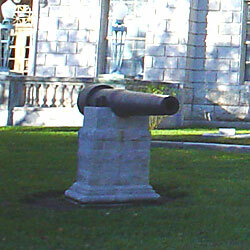 The breech has been modified so as to convert the weapon to a breech loader for use as a salute gun. 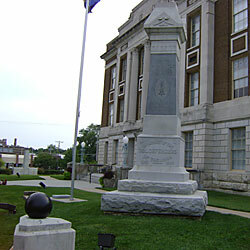 The monument is a granite spire on a brick and granite base. 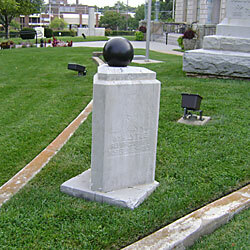 The base is inscribed: "National Cemetery - Number One ~ Dedicated ~ to the Veterans ~ of all Wars". 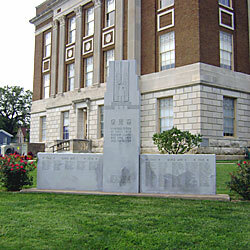 Description: The center portion of this monument is inscribed: "In Honored Memory ~ of Those From ~ Bourbon County ~ Who Gave Their ~ Lives for Freedom" and"In Memory of Those Who Gave ~ Their Lives that our Nation ~ might Live. This monument ~ was erected A.D. 1947 by ~ Charles W. and Clara A. Bruce" The side panels are engraved with names and the identifiers "1917, World War I, 1918" and "1941, World War II, 1945". 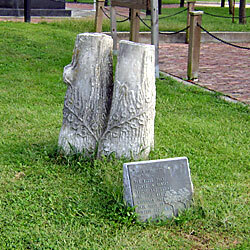 Description: Twin trees are mounted behind a memorial plaque that is inscribed: "Historic Fort Scott ~ 1842 - 1865 ~ The blood that ~ flowed in Kansas ~ before and during ~ the Civil War ~ nourished the ~ twin trees of ~ Liberty and Union ~ Erected by ~ United States Department of the Interior ~ National Park Service.